Defense Minister ouster linked to criminal investigation | Russian Legal Information Agency (RAPSI). NOVO-OGARYOVO, November 6 - RAPSI. President Vladimir Putin dismissed Defense Minister Anatoly Serdyukov on Tuesday in order to ensure impartiality in the criminal investigations currently pending which concern the ministry. Putin explained, "Taking into consideration the situation that has emerged regarding the Defense Ministry, in order to create the requisite conditions for an objective investigation of all the issues, I made the decision to relieve Defense Minister Serdyukov of his duties." 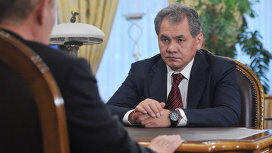 Sergei Shoygu, formerly the governor of Moscow Oblast, has taken over as Defense Minister. Russia's Defense Ministry has recently become embroiled in a scandal over alleged real estate scams involving nearly $100 million run by state defense firm Oboronservis. 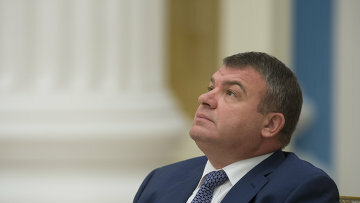 Serdyukov will be interrogated in connection with the case if necessary, Investigative Committee spokesman Vladimir Markin told RIA Novosti. “Serdyukov’s dismissal has been long-awaited; it's a timely decision”, Alexander Torshin, first vice-speaker of the upper house of parliament’s, told RIA Novosti. Oboronservis consists of a number of service companies involved in armaments and military vehicle repair and maintenance, construction materials and food production, power facilities operation, cartography and printing goods production, as well as housing services for military towns. It also reported that a probe had been launched against former Defense Ministry Property Relations Department head Yelena Vasilyeva. According to investigators, ministry officials bought and invested in commercially attractive facilities that were later sold at substantially reduced prices. The preliminary losses from the sale of eight properties amounted to over 3 billion rubles ($95.24 million). The Accounts Chamber completed an audit at Oboronservis in February 2012 and submitted the results to the law enforcement authorities, according to the chamber. The performance audit was held from October 2010 to February 2012. "The board decided to send a letter to the Defense Ministry informing them of the findings," the chamber said. "The report and the information regarding the violations that were uncovered were sent to the Federal Assembly, the Federal Security Service, and the Main Military Prosecutor's Office. The country's leadership has been informed about the situation." In addition, the Moscow Khamovnichesky District Court has issued a warrant for the arrest of Yekaterina Smetanova, suspected of fraud in the Oboronservis case for selling property on Moscow's Smolensky Bulvar at reduced prices. A law enforcement officer testifying at a hearing said that investigators have reason to suspect that Smetanova may try to flee from the country in a Defense Ministry plane. The officer said that in a previous incident of a similar nature, Smetanova claimed to be an employee of the Defense Ministry property relations department, and left for Paris from Chkalovsky airport using a ministry plane, together with the former head of the property relations department Yevgenia Vasilyeva. Also, the investigator added when explaining the necessity of placing Smetanova in custody, the employees of the Expert Center of Legal Support, which she previously headed, assisted her in destroying documents which served as evidence in the Oboronservis case. 14:29 06/11/2012 President Vladimir Putin dismissed Defense Minister Anatoly Serdyukov on Tuesday in order to ensure impartiality in the criminal investigations currently pending which concern the ministry.